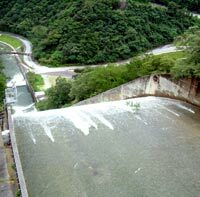 Six dams in Okinawa are now full, and actually overflowing, thanks to heavy rains that have fallen across the islands the past few days. Kanna Dam’s reservoir is full, and water is cascading over it now, bringing smiles and "Gosh! Golly!" Smiles to residents who’ve been worried about water shortages later this summer. Okinawa General Bureau reports 4,300,000 tons of water now fill the reservoir thanks to rainfall on the 12th and 13th that brought downpours totaling 100mm. Additional rains since have further swollen the reservoir levels. 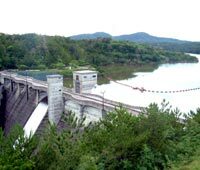 Zamami Island residents hade been worried about a water shortage, but now Zamami Dam is 100% full. Officials are cautioning against complacency regarding water shortages, and even water rationing, because they say there may not be as much rainfall as normal.